Daniel Plumer settled in Wausau in 1857 when he was just 20 years old and began working as a surveyor of timber lands. He worked his way up in the lumbering industry and invested very successfully in timber lands, sawmills, mining and real estate. In 1868, he and a partner started the Silverthorn & Plumer Bank, which became the First National Bank of Wausau in 1882. Plumer continued as president of the bank until the time of his death in 1920. 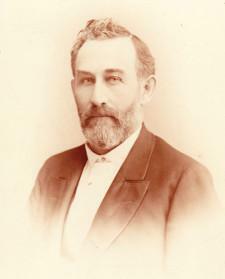 Plumer also served as Mayor of Wausau for three terms and was elected to the Wisconsin state legislature in 1873. As mayor, he was instrumental in establishing local schools, bridges, better fire protection, and the Marathon County Fairgrounds. During his sixty years as a prominent business and civic leader, Wausau’s population grew from 500 to 20,000.